DC’s Young Animal line has made a triumphant return after most of its titles went on brief hiatus late year, and the imprint’s publishing schedule indicates the intelligence behind its development and execution. When a Young Animal series hits 12 issues, it ends the first volume and the creators take a break before coming back with an updated concept building on what came before but taking characters in new directions. Last month’s weekly “Milk Wars” event built up anticipation for these returns, and reinforced how the Young Animal point of view differs from that of the main DC Universe with a very strange, very meta superhero crossover. Each issue of “Milk Wars” featured a short story by writer Magdalene Visaggio and artist Sonny Liew setting up their new Eternity Girl miniseries, introducing readers to the tragic superhero Caroline “Chrysalis” Sharp with back-up comics that embraced different styles of the superhero genre. Eternity Girl is a surreal, deeply personal tale about a woman struggling with her identity and desperate to kill herself, but her shape-shifting superpowers make suicide impossible. Superheroes are often fantastic metaphors for specific emotions, and Caroline Sharp represents a despair so extreme that it eventually goes beyond the individual and threatens all of existence. Unable to take her own life, Caroline is tempted by a malevolent force that promises to fulfill her wish, and all she has to do is destroy all of space and time to achieve her final peace. This exclusive preview of Eternity Girl #1 details one of Caroline’s regular suicide attempts as she chats with her therapist, and it highlights the balance of superhero spectacle and emotional introspection that makes this first issue so compelling. Visaggio’s work on Kim & Kim has her juggling humor with character-centric drama and sci-fi excitement, and she’s bringing even more ambition to the table with Eternity Girl, amplifying the tonal contrast as the story shifts from Caroline’s dreary present to her vibrant past. The visual elements of this book are remarkable, starting with a cover and logo that immediately accentuate the instability of the main character. Tom Muller’s logo features three-dimensional letters pushing each other out of sequence, and it blends very well with Sonny Liew’s checkerboard design for the main cover image. Liew is an all-star cartoonist who showed off his deep understanding of the comic-book medium in his Eisner Award-winning graphic novel The Art Of Charlie Chan Hock Chye, and the range of his talent makes him an ideal artist to bring Visaggio’s complicated, off-kilter story to the page. Working with colorist Chris Chuckry, Liew creates stark, evocative images that intensify Caroline’s emotional state, like the page showing her standing on the ledge of a bridge just before she jumps. There’s a large, zoomed-out shot that shows the bridge’s size and the length of the drop, and it emphasizes Caroline’s loneliness with the tiny figure of her surrounded by the cold expanse. 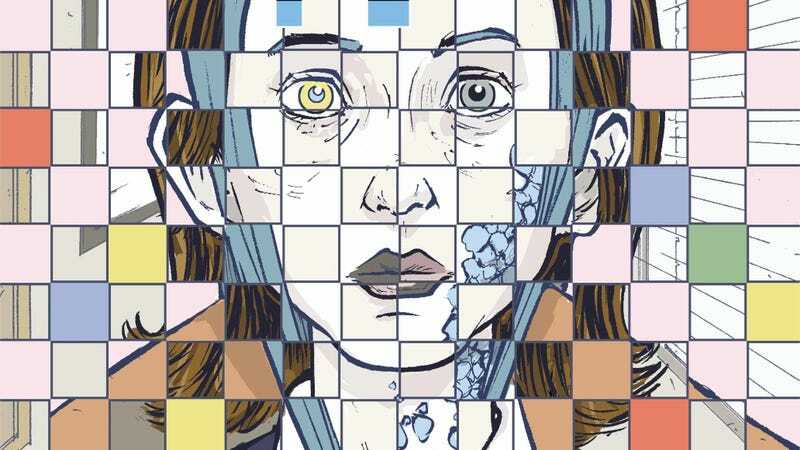 Eternity Girl is full of these expressive moments, and it’s another engaging debut from a fascinating superhero imprint.